San Miguel Corporation’s (SMC) unsolicited proposal to build a Php735.6-billion international airport in Bulacan has been approved by the National Economic and Development Authority (NEDA) board on Wednesday, April 25, the agency said in a statement. 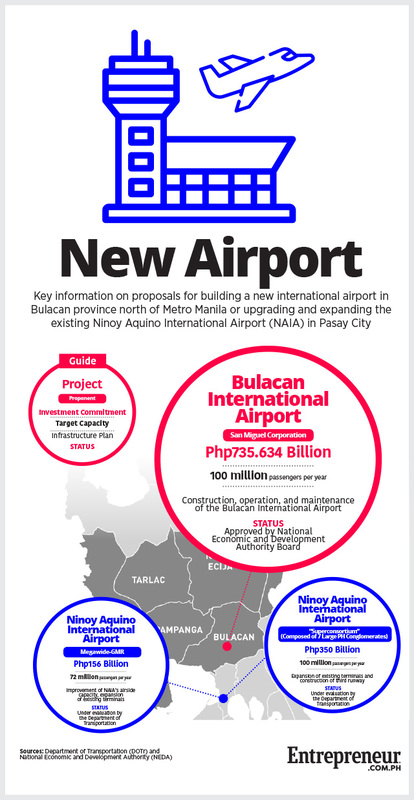 The proposal includes the construction, development, operation and maintenance of Bulacan International Airport to be located in Bulakan, Bulacan, which has an estimated area size of 2,500 hectares. SMC plans to build a terminal building equipped with airside and landside facilities and an 8.4-kilometer airport toll road. The Bulacan International Airport aims to accommodate 100 million passengers a year. This is a big improvement compared to the Ninoy Aquino International Airport’s (NAIA) current capacity of 30.5 million passengers. Though a crucial step forward, the NEDA Board approval does not mean San Miguel can now proceed to build the new international airport right away. NEDA officials explained that the Department of Transportation (DOTr), the implementing agency, still needs to subject the proposal to a competitive challenge. It will give other interested proponents a chance to match San Miguel’s proposed project at a lower cost. The next steps will be up to the DOTr, which is also evaluating other proposals to address congestion at the Ninoy Aquino International Airport. Just last February, seven of the country’s biggest conglomerates submitted a Php350-billion joint proposal to improve NAIA. Less than a month after, Edgar Saavedra’s Megawide Construction Corp. challenged it with its own $3-billion pitch. Meanwhile, the NEDA Board also approved projects along with the Bulacan International Airport. These include the Subic-Clark Railway Project, Clark International Airport Expansion Project-Operations and Maintenance PPP Concession, Ambal-Simuay River and Rio Grande de Mindanao River Flood Control Projects, Pasig-Marikina River and Manggahan Floodway Bridges Construction Project, Bridge Construction Acceleration Project for Socioeconomic Development, Rural Agro-Enterprise Partnership for Inclusive Development and Growth (RAPID Growth) Project and Davao Food Complex Project. All in all the eight newly approved projects have a combined estimated cost of Php832.6 billion. “We are pleased to see more infrastructure projects in the pipeline. As we roll them out, government shall keep working towards developing the country’s infrastructure to ensure easing of congestion in Metro Manila and spreading growth to the regions,” said Socioeconomic Planning Secretary Ernesto M. Pernia during the 6th NEDA Board meeting of the Duterte administration. Which of PH’s Best-Known Law Firms Make the Most Money?